PFO Closure for Stroke, Myocardial Infarction, Peripheral Embolism, Migraine, and Hypoxemia covers the association between Patent Foramen Ovale (PFO) and numerous clinical conditions. 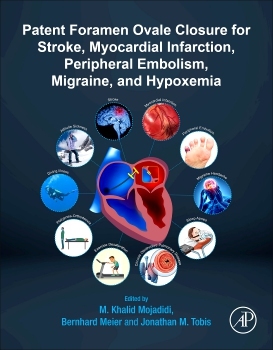 The book provides a background on the topic of PFO, including embryology, anatomy and physiology, fully examines the diagnosis and imaging assessment of PFO, and discusses the data linking PFO to various clinical conditions, including stroke, myocardial infarction, peripheral embolism, migraine, hypoxemia, decompression sickness, Raynaud’s phenomenon and vasospasm. In addition, the book includes perspectives that focus on future outlooks on PFO closure and where the field is headed. User will find this to be a perfect reference book for cardiology researchers, cardiologists, interventional cardiologists, general practitioners and medical professionals that are interested in current safety and technical aspects in the field. Dr. M. Khalid Mojadidi is an invasive Cardiologist affiliated with University of Florida Health- Shands Hospital. He is also an assistant professor at Virginia Commonwealth University. He is a current member of the American Society of Nuclear Cardiology (ASNC), American College of Cardiology (ACC), European Society of Cardiology (ESC), European Association of Preventative Cardiology (EAPC) and the American College of Physicians (ACP). Dr. Mojadidi is an active peer reviewer of 12 current journals. Bernhard Meier has served from 1992 to his retirement in 2015 as full Professor of Cardiology and Chairman of the Department of Cardiology at the Swiss Cardiovascular Center Bern of the University of Bern, Switzerland. Since 2016 he has served as Senior Consultant. Meier has been a personal assistant to Andreas Gruentzig, at the time Gruentzig introduced coronary angioplasty into clinical medicine. Hence, he has been involved in the procedure starting from the world’s first coronary angioplasty patient, treated in Zurich on September 16, 1977, to the current day. He has personally performed thousands of coronary angioplasty and other catheter-based cardiac procedures Meier has written countless articles, reviews, and book chapters about interventional cardiology. He has also been involved in teaching in this field for 40 years, organizing and conducting dedicated courses and seminars and participating in events around the world. Dr. Tobis is the Director of Interventional Cardiology Research at UCLA and Clinical Professor of Medicine in Cardiology at the University of California. He also serves as a Member of the Medical Advisory board of Coherex Medical, Inc. He is the winner of several industry awards including the Simon Dack Award from the Journal of the American College of Cardiology; Named Master Fellow of the Society for Cardiovascular Angiography and Interventions (MSCAI), the professional medical society for adult and pediatric invasive/interventional cardiologists; voted one of America's Top Doctors by US News and World Reports, and voted one of the 10 Most Highly Regarded Heart Doctors in the US.